The research that we report here is related to amorphous magnesium-calcium phosphate (AMCP) materials. The word “amorphous” is of latin origin; “a” means no and “morphous” means shape. The amorphous materials do not have the well-behaved periodic structures of conventional crystalline materials. They can be found extensively in nature and are often referred to as “glass”. Materials that are in between the two classes can rightly be called “Nanocrystalline”. Among existing amorphous minerals, calcium phosphates are most abundant and studied materials in the biomedical fields. These materials are ubiquitous in their presence in mammalian bones. However, less attentions have been paid to study the preparation of amorphous magnesium phosphates or amorphous magnesium-calcium phosphates and their transformation into their relevant crystalline phases. The properties of magnesium phosphates are similar to or in many cases, better than calcium phosphate materials. Therefore, amorphous magnesium-calcium phosphates (AMCP) represent a unique class of orthopedic material which can be used as substitution for biominerals in the human body, also referred to as bone grafts. Bone grafts are useful in treating orthopedic disorders, such as osteoporosis, bone cysts, tumors, spine fusion, and traumatic fractures. The bone graft can be in the form of dense body or porous structure. In view of the above, the importance of AMCP in biomaterial relevant applications can be stated as follows. First, they are absolutely safe for body (biocompatible) due to significant chemical and structural similarities with mineral found in bone and teeth. Second, they show a unique characteristic of getting converted into actual bone tissue upon contact with the body fluids. Third, the amorphous feature provides the flexibilities in manufacturing in various shapes and forms, porous and non porous (dense) structures. Last but not least, the AMCP materials being synthetic (not derived from animals or human) can be produced in large quantities. This last characteristic provides a suitable replacement over the natural bone graft resources obtained from animals or human. Natural materials are always in limited supplies and carry a risk of infection upon transplantation into the patient’s body. Therefore, an easier solution is to look for synthetic bone graft substitutes. We synthesized AMCP materials using alcohol assisted-precipitation method as alcohol promotes the formation of amorphous phase. Different ratios of magnesium versus calcium, and magnesium+calcium versus phosphate, and different drying techniques were experimentally studied. Our results suggest that at an equal concentration of magnesium and calcium the AMCP can be produced, which also can preserve its amorphous structure after soaking for 7 days in simulated body fluid. 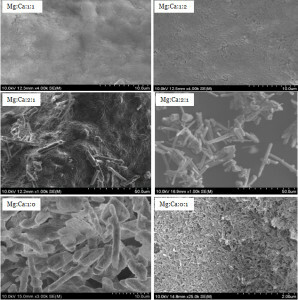 Furthermore, depending on the magnesium concentration, another mineral, struvite (MgNH4PO4.6H2O), in nanocrystalline structure can also be formed from an amorphous precursor. While, increasing the calcium concentration in solution lengthened the crystallization time of struvite or affect its crystal shape, leading to the formation of amorphous matter as a dominant phase. The biocompatibility characterization also confirmed that all precipitants of various calcium-magnesium phosphate compositions were biocompatible, and completely safe for the body. Influence of ethanol content in the precipitation medium on the composition, structure and reactivity of magnesium-calcium phosphate.